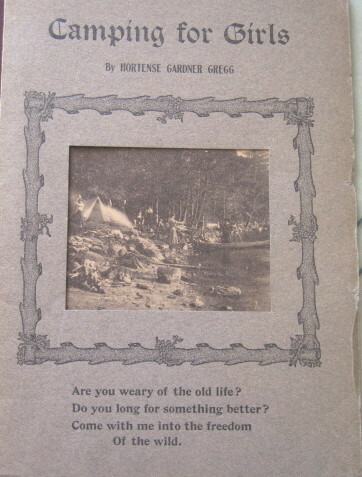 Hortense Gardner Gregg Gates (1879-1967) was born in Buckfield, but lived most of her life in Norway. She has always been known by her complete given, middle, maiden and married names. 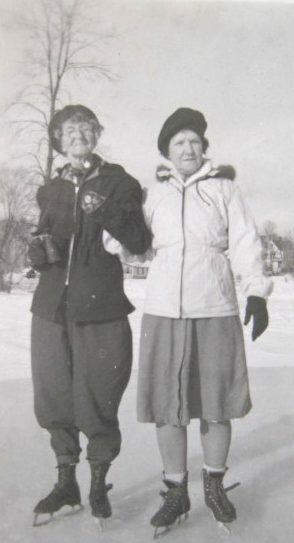 Mrs. Gates was noted as both a poetess and an avid outdoorswoman, who held the distinction of skating on Norway Lake each winter for 76 consecutive years. 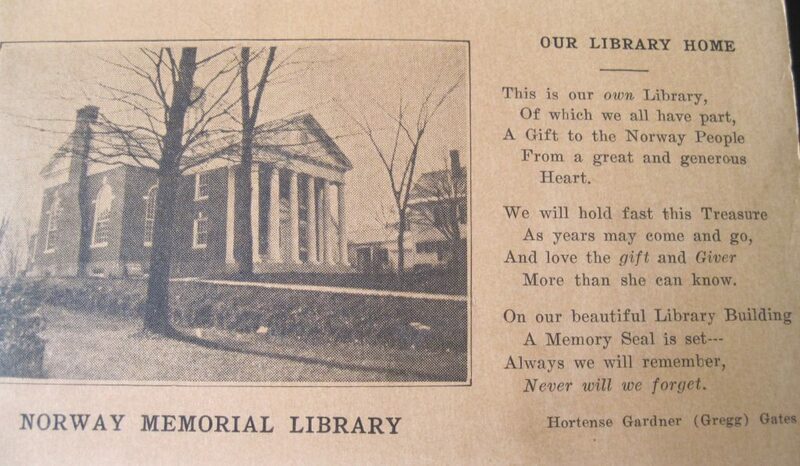 Her poetry reflected nature, friendship and her hometown. She was included in the book Important American Poets and Songwriters, published in 1947. Mrs. Gates’s significance was reported in an article written for the Advertiser-Democrat. 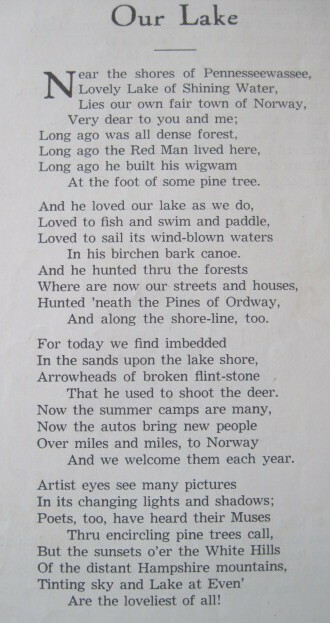 George Howe, the author of the article, was a naturalist and a Norway native famous in his own right. I have recently made a careful review and analysis of Edith Warren’s recently published work “Important American Poets and Song Writers,” and I herewith submit a few results of this analysis concerning Mrs. Gates’ position in the work which would be of interest to people of Norway, of the State of Maine and the United States. The work has five hundred and seventeen pages devoted to the poems of three hundred and eighty-six authors, giving the average of pages to each author approximately one and one third pages. The authors have been selected chiefly from the United States but a few others have been selected from the Dominion of Canada, Newfoundland, British West Indies and England. Maine thus ranks second in the New England States. The authors selected from Maine have residences in Norway, South Paris Fryeburg, Caribou, Dexter, Portland and South Portland. Oxford County thus has three of the seven authors selected from the State of Maine. Mrs. Gates has been allotted space for seven poems out of a total of twenty-two for the whole state or one third of all within the state. She has been allotted for these seven poems four pages in the work. Only one author has been allotted more (five pages) and only three others have been allotted the same number (four pages). 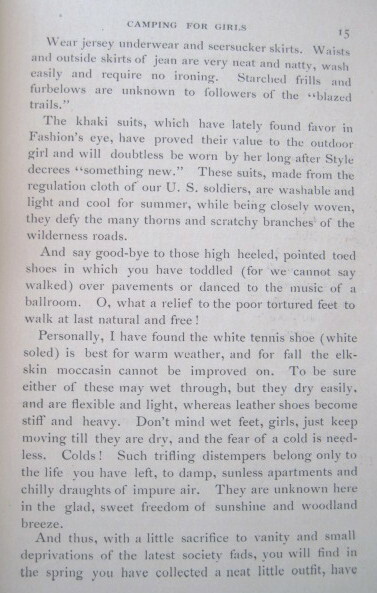 The one author given one more page is from Fort Wayne, Ind. One of these pages is devoted to “Dedication in Prose, “having only” Prologue in Prose,” leaving only three poems, two of which have the subject “The Fools,” not deser­ving space in the work. One of the three given the same number of pages as Mrs. Gates contributes five poems on TVA and Franklin Roosevelt of highly questionable eligibility for such a work. Mrs. Gates’ contribution of the work is viz.. Her poems are all heartfelt, helpful expressions, selected from the natural and social truths of our exceptionally perfect environment with lofty, wholesome sentimental influences, and fully deserve the higher honors conferred upon her than upon any other author in the complete anthology. 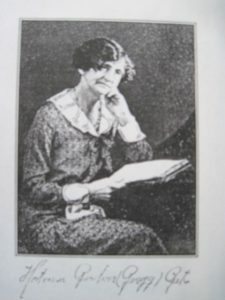 She has previously had published a book “Jack and Jill” composed in her seventeen year girlhood days, for which she set all the type; and booklets: “My Girlhood Poems,” “Memory Gems.” “Grandma’s Knitting Needles,” “Camping for Girls.” She is now arranging for a work of her life poems, “Childhood Chimes and other Poems,” which will be published in the near future. Through Mrs. Gates instrumentality, this highest honor to her is also re­flected upon the town of Norway, the County of Oxford, the State of Maine and all the New England States especially. Let us all reciprocate by bestowing equal honors on Mrs. Hortense Gard­ner (Gregg) Gates. Mrs. Gates shared her love of the outdoors with the young people of Norway. She particularly encouraged girls to understand and appreciate nature by leading hikes and organizing camping trips for them in rural Norway. Mrs. Gates (L), later in life. Still skating.